More than 500 pounds of ancient coins have been dug up at a construction site in east China according to news reports by Chinese print and TV media. The site is located in Guzhen County (固镇县) in Anhui Province (安徽省). Chinese archaeologists from the Guzhen County Bureau of Cultural Relics (固镇县文物局) are seen digging up the cache of buried coins in this news report broadcast by the Anhui TV Station (安徽卫视) on May 18, 2013. 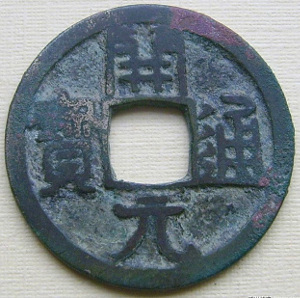 The more than 500 pounds (500余斤) of coins was discovered about one meter below the surface and includes coins with the inscription kai yuan tong bao (开元通宝) which were first minted during the Tang Dynasty (618-907). According to the reports, however, the majority of the coins are from the Northern Song Dynasty (960-1127). The Song Dynasty coins include yuan feng tong bao (元丰通宝 1078-1085), yuan you tong bao (元佑通宝 1086-1093), and chong ning tong bao (崇宁通宝 1102-1106) among others. The coins were found stacked in a very orderly manner. The archaeologists speculate that most of the coins would have been threaded together on strings and then neatly arranged. However, the strings have long since rotted away and many of the coins are now corroded together. The news reports state that the coins probably belonged to a rich family of the Northern Song that wanted to hide the money from robbers or during a time of unrest.